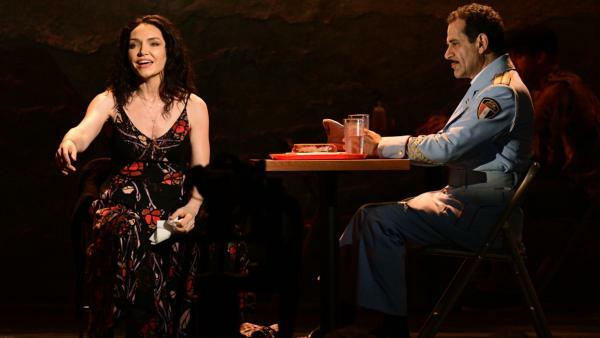 Katrina Lenk and Tony Shalhoub perform "Omar Sharif" from The Band's Visit at the Tony Awards on Sunday night. In fact, it was a relatively quiet but contemplative ceremony on the whole. Hosts Sara Bareilles and Josh Groban were just what this kind of evening needs: They are theater people (well, they are now, having starred respectively in Waitress and The Great Comet). They were amiable and game, opening with a funny and chill little pop song about losing at the Tonys (which they both have done). It wasn't a big blowout welcome like the ones Neil Patrick Harris used to do, but there's genuinely no point in trying to compete with that. These two are singers, and they leaned into their voices. And they did end with a display of ensemble members from every nominated musical. And if you don't love the ensembles, you can't possibly love the Tonys. As for the awards themselves, some things that seemed highly likely panned out, including generous attention for the current revival of Tony Kushner's Angels in America. Andrew Garfield won for his lead performance, talking in general terms about the LGBTQ community and the human spirit before saying, "Let's just bake a cake for everyone who wants a cake to be baked," which now qualifies as a political stance. Nathan Lane won for his featured performance, breaking up as he addressed his husband in the audience and placing the play in the context of a recent effort to take his life in a different direction. Angels also won best revival of a play, beating out versions of Lobby Hero and The Iceman Cometh, among others. One of those others, Three Tall Women, may not have won for the play itself, but both its lead actress and its featured actress did win. Laurie Metcalf, doubtless having more fun collecting a Tony than she would be having talking about the cancellation of Roseanne, won in the featured category. And Glenda Jackson, who's only recently returned from a long break from acting during which she served in the British Parliament (yes, you may insert your exclamation points here if this is new information) won in the lead category. The big winner in musicals was The Band's Visit, based on a 2007 film about a group of Egyptian musicians who accidentally end up staying in an Israeli town. It won best musical, and it took three out of the four acting awards: lead actor Tony Shalhoub (who, yes, you may know from Monk and Wings and Big Night and all sorts of things); lead actress Katrina Lenk; and featured actor Ari'el Stachel, who spoke of what it meant to him as a Middle Eastern actor to be playing a Middle Eastern character. Featured actress in a musical was given to Lindsay Mendez for Carousel, and while she may have been in a different show, she touched on one of the same themes Stachel did, recalling that when she was younger, she was told to change her name to Matthews if she wanted to work. The ceremony producers went well out of their way to include quite a bit of Bruce Springsteen, whose Broadway show received a special award — seemingly for bringing new people into Broadway theaters. On top of that, Springsteen performed a long monologue and a bit of "My Hometown," as he does in the show. While his piece isn't a musical in any traditional sense, it seemed to suffer a little from the same thing that usually plagues musicals that try to present themselves on the Tonys broadcast: Out of context, it didn't really land the way it would in an intimate theater. The SpongeBob SquarePants song featured some of the fun work of presenting Squidward with at least some of his multiple legs — plus it featured group tap dancing, which every Tonys broadcast should have — but it seemed not to quite pop off the stage the way they might have hoped. Frozen was pleasantly Disney, but not much more than that. The Band's Visit did by far the best: "Omar Sharif," a song primarily sung by Lenk as she recalls movies and music she's loved, conveyed the intimacy of the show and of the relationships between the characters without sagging or feeling underpowered just because it was seen in isolation. The revivals of My Fair Lady and Carousel fared fine, with the former highlighting its star, Lauren Ambrose, and then the crowd-pleasing "Get Me To The Church On Time," and the latter going with the choreography of the lesser-known number "Blow High, Blow Low," which is about going out on the sea to go whaling, in case you were wondering. The revival of Once On This Island -- which ultimately won the revival category — had better luck with a high-energy performance from Alex Newell. The show may not be as familiar to some audiences as Carousel or My Fair Lady, but the number seemed better-suited for the context of the Tony Awards than some. But there was more going on here than awards. It can be awkward when awards shows try to address current events — very awkward, in fact. 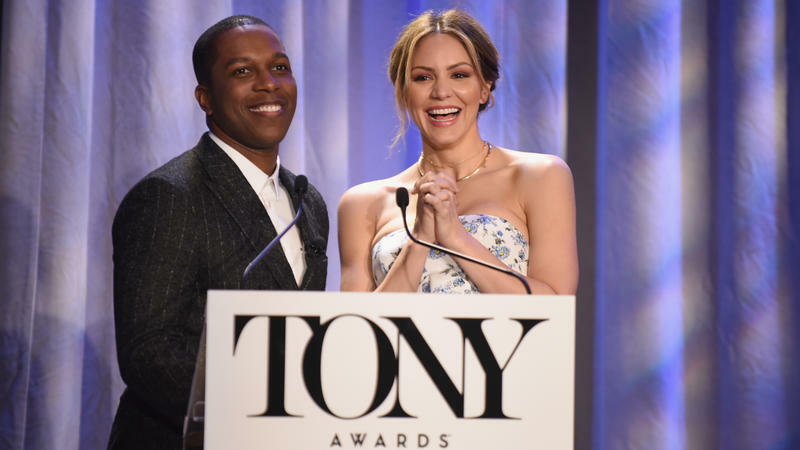 But as it happened, the Tonys had a natural connection to the shooting at Marjory Stoneman Douglas High School in February. The drama teacher, Melody Herzfeld, won the Excellence in Theatre Education Award — not only for keeping students safe during the initial event, but for encouraging her students to use drama and art and music to express themselves after. And while it would have been lovely to see her speech during the ceremony itself (it happened earlier in the evening), what did make the prime-time show was her kids — her drama kids — performing "Seasons Of Love" from Rent. Well, of course they did. It could have been something from Hamilton, yes. But Rent is still a touchstone for theater kids. This has always been the secret ingredient of the Tony Awards: They embrace their kids. Not their kids, not their actual kids — their communal kids. The theater kids, the drama nerds, the kids who find their tribe in plays and the kids who know they want something special but don't find that tribe until they make it out of school and get somewhere else. The Tonys telecast always takes the time to speak to those kids, and while it would have been far better if it had been in different circumstances, it seemed appropriate, rather than forced, to let Herzfeld's students demonstrate some of what she's done for them under these difficult circumstances. It was a lovely broadcast. It felt calm. It didn't feel rapturous, like it did when it was full of Hamilton, and it didn't feel downright riotous, like it did when Sutton Foster performed with the cast of Anything Goes. But it felt charged with the emotion of theater people — talking about welcoming immigrants, talking about supporting people who don't look like us, talking about supporting kids whose lives are touched by violence. Even Robert De Niro, standing up and twice directing his favorite profanity at the president of the United States, seemed anguished more than petulant. Theater people have a lot of feelings. On this night, it showed.